Mark Cavendish (HTC-Highroad) was, once again the king of the Champs-Elysées as he took his third straight victory on cycling’s most famous Avenue. The Manx Missile was launched at the line in the usual flawless precision by his HTC-Highroad lead out train. Opening up his sprint a little later than usual, due to the block headwind in the finishing straight, Cavendish managed to hold off the attentions of previous stage winners Edvald Boasson Hagen (Team Sky) and André Greipel (Omega Pharma-Lotto) to take his own fifth stage of the race. Cavendish now has a personal total of twenty stage wins, and secures his ever green jersey. The sprint finish was by no means a formality though, as a five-man break escaped on the cobbled circuit and was only reeled in on the final lap. The first half of the stage was ridden as a victory parade for Cadel Evans (BMC Racing) but, as soon as the peloton hit the Champs-Elysées, the race began. “If you’ve seen how well my team rode then you’d know that I’m incredibly lucky that I’ve got such a group of guys around me,” said Cavendish of his HTC-Highroad teammates that delivered him to the line once more. “They’ve been committed to the cause of winning races and it’s paid off. It’s not as if we didn’t put it all together and I can’t stress how lucky I am. With no activity in the overall classification, Evans has been confirmed as the first ever Australian to win the Tour de France, having finished second in 2007 and 2008. He finished 1’34” ahead of Andy Schleck and 2’30” ahead of Fränk Schleck. The Leopard Trek riders become the first brothers to stand on the same Tour de France podium. The 2011 Tour de France saw a number of the race’s overall contenders drop out after serious crashes as it crossed the north west of the country in the first week. In the past Evans has been one of the unlucky ones, but in this year’s race he has not crashed once and been at the front of the peloton at every decisive stage. “It’s been years of hard work and there were a lot of moments in this three weeks where our Tour was lost,” he explained. “But to get here safely with all my skin... just that alone is a quest in itself. But to be here wearing the yellow jersey; for my team, my country, a group of people around me... it leaves me a little lost for words. At 95km, the final stage between Crétiel, just outside Paris, and the Champs-Elysées, was the shortest road stage of the race. As tradition dictates, there would be no attacks from anybody in the overall classification but, once the peloton hit the streets of Paris, the usual battle between the breakaway specialists and the sprinters would commence. Cavendish was the outstanding favourite, having won four stages of the 2011 race so far, as well as the last two Champs-Elysées stages. The other team’s had had more success against the HTC-Highroad sprint machine in this race though, disrupting his sprint train on a number of occasions. Tyler Farrar (Garmin-Cervélo) had taken stage three after Garmin-Cervélo managed to overcome Cavendish’s leadout in the twisting finish, while Greipel had beaten the Manxman in a head to head battle on stage ten. Neither the stage, nor the green jersey, were guaranteed. Before the peloton rolled out of the start, a plaque was unveiled in memory of Parisian two-time winner Laurent Fignon, who was a member of the UC Crétiel club, which still boasts riders such as World sprint champion Gregory Baugé. The flag drops and… nobody attacks! Evans’ BMC Racing Team was rolling along on the front at little more than walking pace as the flag was dropped, and nothing changed as race director Christian Prudhomme dropped the flag to start the race. Evans himself drifted back through the peloton to his team car – with its white graphics coloured yellow – to drink a glass of champagne with managers John Lelangue and Jim Ochowitz. Behind the wall of BMC Racing riders there were a number of riders, who seemed to be waiting for the moment that they would be allowed to attack. This was not to happen though, as the pedestrian pace continued on the way through the Paris suburbs. After around 10km, Evans switched from the yellow bike that he started on to the normal black and red Team Machine that he has raced on throughout the whole Tour. The new bike had his race number behind the saddle, indicating that it was a premeditated move to have him race the stage on the bike that he was used to. After 15km the speed rose a little but the whole peloton was still bunched up behind the BMC Racing Team and, once the race hit Paris itself the speed went up with the entire red and black team escorting its yellow jersey. The old tradition of the French riders competing to see who could be the first rider on the Champs-Elysées has given way to the new tradition of the yellow jersey’s team leading the race onto the final circuit. The BMC Racing Team was still lined up on the front as it hit the Champs-Elysées, with George Hincapie - riding his sixteenth Tour, of which this was the ninth as a member of the winning team – leading over the finish line to start the eight 6km circuits. Once over the line the race was on, with Juan Antonio Flecha (Team Sky) forcing the pace on the way down the Champs for the first time. The first rider to force a gap though, was Rui Costa (Movistar), who opened up a hundred-metre gap at the front. The Portuguese rider, who won stage eight to Super-Besse – was joined at the front of the race by French champion Sylvain Chavanel (Quick Step) and Grischa Niermann (Rabobank), but the three of them were quickly brought back into the fold. The peloton was all together for the rest of the lap, but on the second lap Ben Swift (Team Sky) got away alone on the way down to the Place de la Concorde. He was chased and joined by Jérémy Roy (FDJ), Lars Bak (HTC-Highroad), Christophe Riblon (AG2R La Mondiale), Krisjan (Liquigas-Cannondale) and Sergio Paulinho (RadioShack) and the peloton relaxed and let them go. As they crossed the line for the third time the six riders led by 27 seconds, and were heading towards the intermediate sprint on the Haut des Champs, just before the turn at the top of the Avenue. Roy, who had been on the attack virtually every other stage in the race, was just pipped on the line by Koren to take first place over the line. 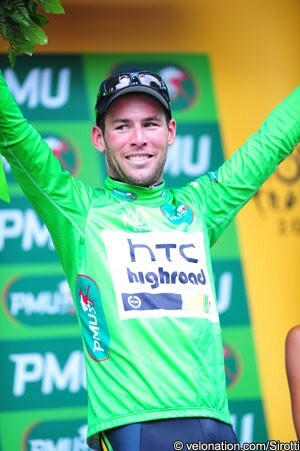 Behind them, HTC-Highroad was getting Cavendish organised to mop up the remaining points towards his green jersey. Behind the HTC-Highroad train, Movistar was bringing Cavendish’s points rival José Joaquín Rojas forward but, in a rehearsal for the final sprint for the stage, the American team delivered the Manxman over the line in style. Rojas had to go around a succession of HTC-Highroad leadout men, who were trying to deprive him of further points, and could only manage third in the group behind Cavendish and Mark Renshaw. Cavendish took nine points to Rojas’ seven, extending his lead in the overall competition to seventeen. The group of six was now 34 seconds ahead, as Cavendish stopped to change his bike at the top of the Champs-Elysées. Just like Evans, Cavendish was changing from a special green-graphics Specialized bike back to his usual McLaren Venge for the rest of the stage. With Bernhard Eisel pacing Cavendish back to the peloton, it was led by the Omega Pharma-Lotto and Garmin-Cervélo teams, who were holding the gap at 35 seconds. The gap remained static as they crossed the line with four laps to go. There was a minor incident as Carlos Barredo (Rabobank) crashed as the peloton slowly made its way around the tight hairpin at the top of the road, but was okay and chased through the cars to rejoin the rear of the field as it left the Place de la Concorde. The gap drifted out to 40 seconds in the mid part of the lap, but was down to 37 seconds with three to go. Quick Step joined the chase midway through the lap, with Lampre-ISD joining before they reached the line and, with two to go it was down to 27 seconds. Bak was sitting in at the back of the six-man group, doing nothing to contribute to the pace of the break with his man Cavendish hoping to take the stage. The others were working hard though, and with 10km to go their lead was still 23 seconds. Chavanel and former Dutch champion Niki Terpstra were the two Quick Step riders driving a ferocious pace on the front of the peloton though, and, by the time the breakaway took the bell to start the final lap, they had cut the deficit to just 13 seconds. There was no time to relax though as, with only 6km to race, there was still a chance for the six riders to make it. Straight after the bell Barredo, who’d hit the cobbles a few laps earlier, jumped to try and join the leaders. He was not allowed to get far though, while ahead of him the breakaway was beginning to split up. Swift, who’d started the move, decided to try to go it alone as they approached the top of the road, as the still-fresh Bak managed to chase up to him. The Danish rider went straight over the top of the young British rider and took the hairpin bend at the top alone. Lampre-ISD was in full cry on the front as the peloton took the corner just a few seconds behind the lone Bak. As HTC-Highroad got Cavendish’s sprint train organised though, there was briefly the peculiar spectacle of the team on the front chasing its own man. With 3km to go Bak led by 11 seconds, with Swift in between. The Sky rider was caught before he could get to the Place de la Concorde, while Philippe Gilbert (Omega Pharma-Lotto) finally pulled Bak into the fold just before he hit the final two kilometres. The Belgian champ led into the tunnel with World champion Thor Hushovd (Garmin-Cervélo) on his wheel but, as the race approached the flamme rouge HTC-Highroad took over in the form of Eisel. The Austrian pulled over, leaving the previous day’s time trial winner Tony Martin on the front, who in turn handed over to Matt Goss as he hit the Place de la Concorde. Renshaw took over as they rounded the corner onto the Champs-Elysées, and he handed over to Cavendish with less than 200m to go. Double stage winner Edvald Boasson Hagen (Team Sky) tried to pass the Manxman on the right as stage 10 winner André Greipel (Omega Pharam-Lotto) went left but neither could make any impression as the Manxman kicked again. Cavendish celebrated by showing off the green jersey that he had finally won; behind him Evans crossed the line safely and collapsed, in tears, into the arms of his teammates.